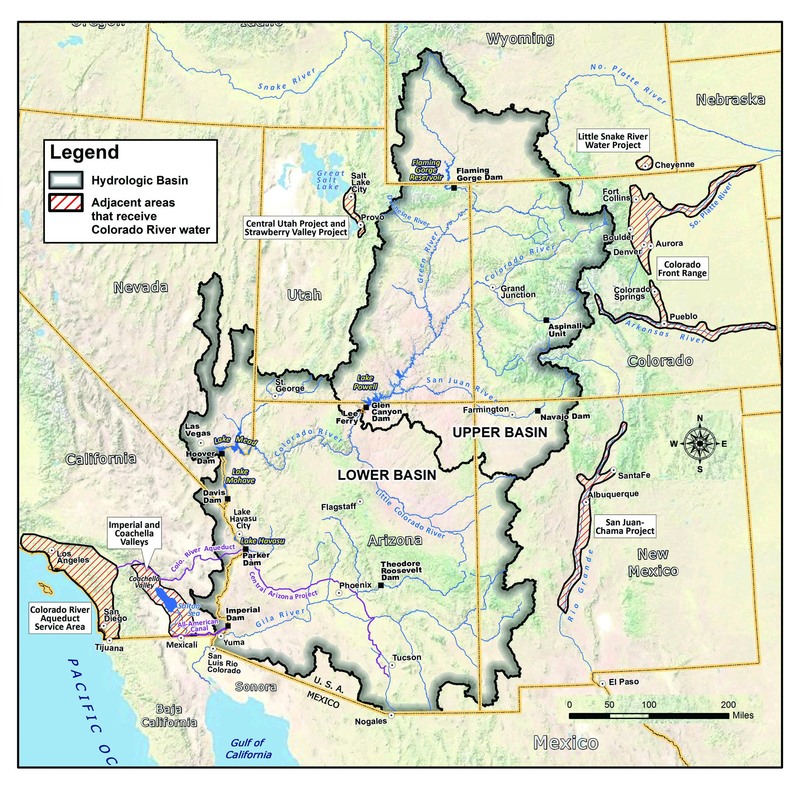 The untapped reserves of oil shale and tar sands (also called oil sands) in the Green River Formation of the Colorado River basin surpass the reserves of conventional oil in Saudi Arabia. More than half of the total bitumen deposits in the United States are located in the State of Utah, totaling over 30 billion barrels of oil in the form of tar sands. If the tar sands industry succeed in taking root in Utah, and the footprint spreads into Colorado and Wyoming, the impacts to land, air and water could impact all 40 million people relying on the Colorado River. Tar sands is the dirtiest form of energy on the planet. Extracting, refining and burning tar sands produces three to five times as much CO2 as petroleum, which contributes dramatically to climate change. Pile of tar sands ore at PR Spring facility. The Colorado River system is already stressed from over-us; polluting and using vast amounts of water to mine tar sands and oil shale is a dead-end for everyone. Utah occupies a uniquely important place in the fight to ensure these dirty fuels stay in the ground. Right now, massive amounts of infrastructure are being constructed to support this burgeoning tar sands and oil shale industry. Test Pit at PR Springs sitting at the tri-divide of the White, Colorado, and Green Rivers. Mining for tar sands are incredibly destructive. Tar sands are a semi-solid asphalt-like substance spread in a layer under the earth. They ooze and move when it’s hot out, but don’t flow like oil. When mined, the trees, vegetation, and habitat on the surface of a deposit are scraped off and pushed into a pile. The “overburden,” layers of rock above the deposit, is then pushed with massive earth moving machines into gullies, ravines, and canyons previously filled with abundant wildlife and ephemeral seeps and creeks. The tar sands are then scraped up and moved to an onsite processing facility. There, the ore is pulverized, mixed with chemical solvents, water and run through a processing machine which hypothetically separates the tar from the sand. An area the size of Rhode Island is currently available for oil shale and tar sands leasing, though no technologies have been proven to work at the scale required. Tar sands mining requires 1.5-4 barrels of water for every barrel of oil produced. This water, mixed with carcinogenic chemicals and other toxins, is used to wash the tar, and then released onto the surface of the ground with out so much as a lined pit to trap the chemical laden water. These high canyons are head water streams for the Green and Colorado Rivers, which supply nearly 40 million people with drinking water. The tar sands, once mined and processed on site, will have to be refined. The logical place this might happen is Salt Lake City, where the refineries already processes some tar sands from Alberta, Canada. Salt Lake City has some of the worst air quality in the world. To impose the burden of refining this toxic fuel on the communities in the Wasatch Front is unacceptable. The other option would be to expand and pave the Book Cliffs Highway south into Grand County. If this option goes through, it is likely that a refinery will be built in Green River to process the tar, polluting the Moab Valley and the Green River. Tar sands and oil shale are not normal fuels; they require huge amounts of chemicals and energy to turn them into a liquid oil. This extra energy could come in the form of natural gas, coal, or nuclear power (perhaps the proposed Green River Power Plant). Tar sands produce over 3 times the green house gas emissions of regular oil, while also destroying complex and carbon-sequestering ecosystems. We can not afford to further climate change while using up our precious water reserves in the process. These industries rely on public money to make a profit. The Utah Community Impact Board was created to help communities cope with the impacts of oil, gas, and other mining. Instead, much of that public grant money is being used to create roads, power lines, and other infrastructure required solely for extreme energy extraction and providing no benefit to the nearby communities. $86.5 million dollars of public money were spent on upgrading the paved highway, Seep Ridge Road, leading directly to the PR Spring tar sands mine. Another $150 million dollars of public money could be spent to connect that road to 1-70 (the Book Cliffs Highway). This money should be used to aid in a community transition AWAY from fossil fuels, not to further entrench us in a dying industry. The Tavaputs Plateau, aka the Bookcliffs, where many of the deposits lay, is world renown area with quality back country and big game hunting. It’s high elevation (8,000 ft) forests full of aspens, Douglas-fir, ponderosas, and scrub oak. Elk, deer, bear, coyotes, cougars, sage grouse, and many other important species make their homes in this vast plateau. The Tar Sands Triangle, the biggest single deposit of tar sands in Utah is nestled in wild canyon country between Canyonlands National Park and the San Rafael Swell.